Beautiful palaces, adorable puppies and precious jewels galore are part of what make Marie Antoinette, a dreamy modern classic. 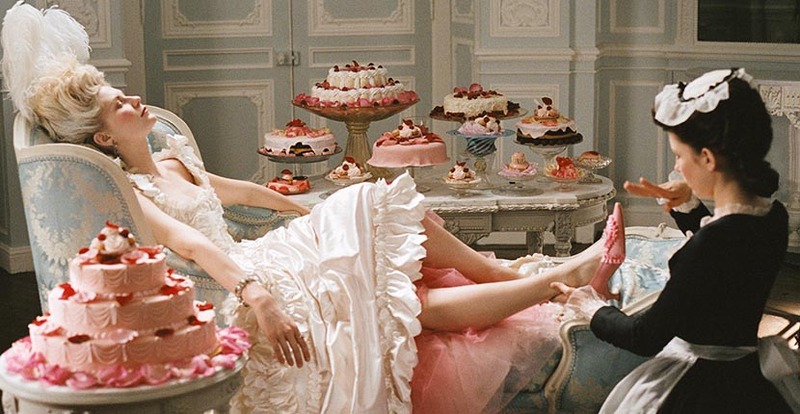 The depiction of life at Versailles in the Sofia Coppola film, that premiered in theaters 10-years ago, on October 20, 2006, is not a literal retelling of facts as some shortsighted reviewers felt compelled to disparagingly point out at the time. I mean obviously. It begins with Gang of Four’s hit “Natural’s Not In It” and titles in shocking pink and black designed by Peter Miles to look like a post-punk album cover. If the music and titles were not a give away that this was a riff on yesteryear, the sort of blind casting of actors from any number of nations playing French parts without trying to imitate an accent should have let the critics know Coppola was using the historic setting as a metaphor. 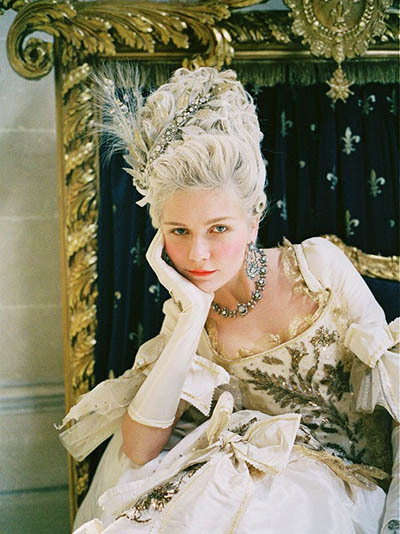 The young queen, Louis XV and Louis XVI are all played by Americans—Kirsten Dunst, Jason Schwartzman and Rip Torn. English, Australian and Italian actors fill other key roles. To keep the audience on its toes, there is some casting connected, however tangentially, to the facts of the story. Marianne Faithful, whose mother was an Austro-Hungarian baroness, plays Marie Antoinette’s mother Maria Theresa, the Austrian archduchess and Holy Roman Empress of the Habsburg Dynasty. Jewelry designer Victoire de Castellane who is a descendant of French aristocracy was among the extras. Then there are the locations. Most of the film was shot at Versailles where the action actually took place. The mix makes the movie feel as modern as it does a period piece. A link to contemporary decadence can easily be made in the party scenes, shopping montage and a moment with the court hair dresser. The movie does go deeper emotionally, as Roger Ebert eloquently wrote, “This is Sofia Coppola’s third film centering on the loneliness of being female and surrounded by a world that knows how to use you but not how to value and understand you.” It’s a film with as many layers as an onion but to focus on our raison d’etre—the jewelry is divine. The costume designer Milena Canonero covered countless characters in all kinds of beautiful baubles. Oh sure some of it is paste, but it looks good and there is $4-million of the real deal on the royal members of the households. All of fine jewels came from the legendary New York City vintage emporium Fred Leighton. Expertly arranged by the firm’s long time celebrity liaison Rebecca Selva, it may not have been exact to period but the effect is wonderful on screen. Marianne Faithfull wears a treasure trove in her scenes. Jason Schwartzman’s hand twinkles with an opal and diamond ring that gets lots of luscious close ups throughout the movie. He even wears it in bed. 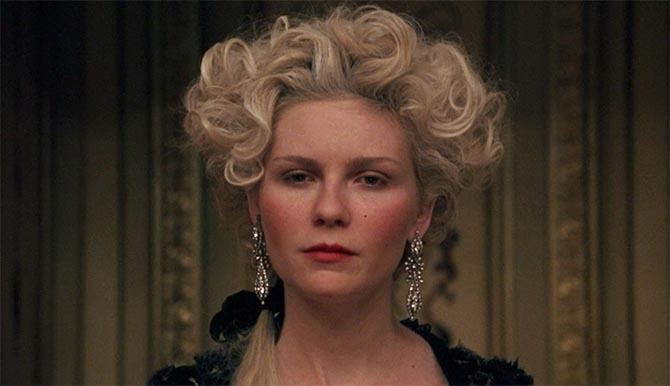 Naturally, the jewels of leading lady, Kirsten Dunst, are the best. Her pieces begin all sweetness and light with a heart-shape diamond wedding ring, then it moves on to a pink topaz and gold rivière and on up over-the-top. Her collection includes gorgeous 18th century moon and star pendant earrings set with 25-carats of diamonds and a large 19th century feather brooch. When the court turns against the young queen as public sentiment goes south, she wears a dramatic pair of pendant earrings to the opera that have a sharp dagger shape at the bottom. 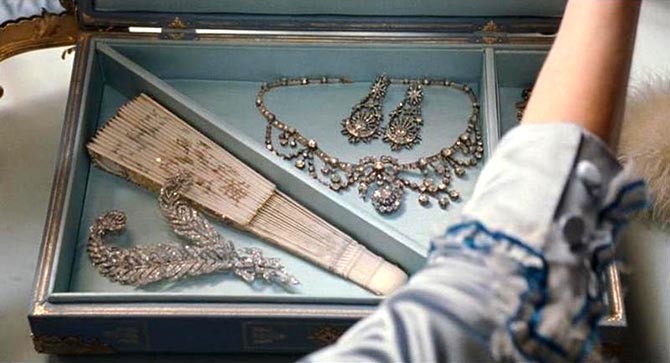 Just looking at how Antoinette’s experience is reflected in the jewelry, it is easy to see why Canonero won an Oscar for the costume designs in the movie. See how the Marie Antoinette necklace makes an appearance in the Katharine Hepburn 1940 classic The Philadelphia Story here.